Bass Cadet has mainly new records. Disco, house, techno and electro from Detroit, Chicago, Holland. Also available is a selection of second hands, albums and hits from the 70’s & 80’s. The 12″ and LP’s are separated in 3 sections 80’s, 90’s, and 00’s. Some 7″, 10″, 12″, LP and Cassettes are also available. 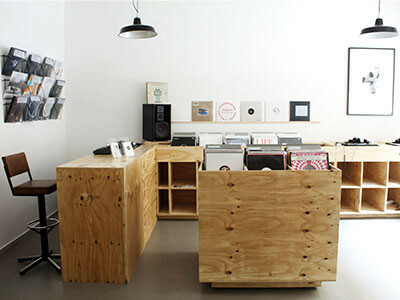 The shop is divided in two parts, a record shop and vintage clothes store, with sofas and drinks, a place to hang out. Bass Cadet has often in-store events with international names and friends from Berlin or elsewhere. So far artist such as Jus’ Ed and Jenifa Mayanja, Florian Kupfer from L.I.E.S., Latency Recordings, Volkan Akin have played or are confirmed to play. Bass Cadet Records is not only a record shop but also a music label, music you’ll find exclusivity from the label Bass Cadet records.